Mülheim, October 18, 2018 – The PD20 expands Turck's RFID product portfolio with a UHF handheld for connecting to a smartphone. 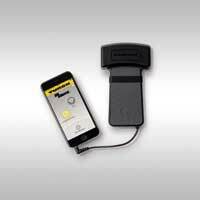 Users can control the PD20 via the free Turck app, which is installed on their Android or iOS smartphone or tablet. Depending on the RFID tag to be read and the environment, the device has a read range of two meters and more. The PD20 enables smartphone use to take center stage. The customer can use an app to collect data with an inventory or read command and change data on the tag using a write command. The user can simply forward the read data by mail from the smartphone and thus make it available for other systems or databases. The terminal device is connected via the 3.5 millimeter jack plug of the smartphone or via a lightning adapter for the latest apple devices.